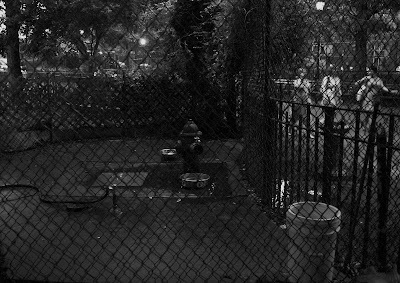 On the evening of 25 July ,2007 the woman in the picture above is digging through the trash in a garbage receptacle looking for styrofoam dinner containers that have been discarded with un-eaten food in them . 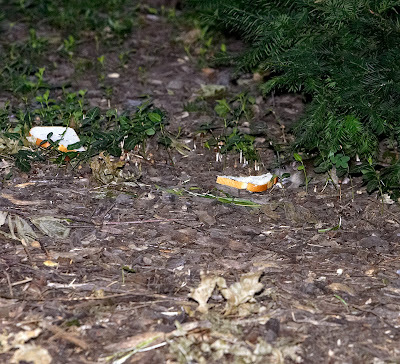 When she finds one with food in it she casts the food ,whatever it may be , on the lawn in Tompkins Square Park just to the west of the large evergreen shrub where all the rats live . On this day she empties the contents of many containers on the lawn . 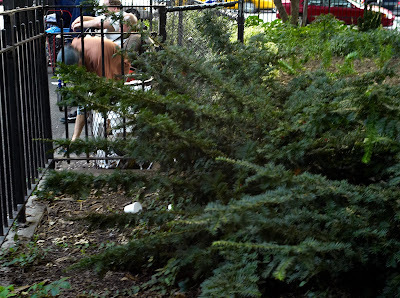 As she was emptying the contents of the styrofoam containers on the lawn several people yelled at her to not do what she was doing but she did not respond to them in any way , she just kept throwing garbage on the lawn . 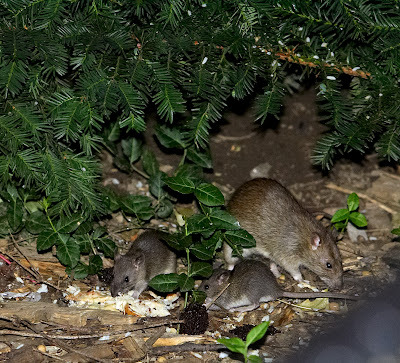 Later some took her aside to ask her what she thought she was doing and expressing their amazement at how she could possibly do what she had done and not realize that she was actually feeding rats and not squirrels and birds . There seemed to be no response from the woman to any of the questioning . 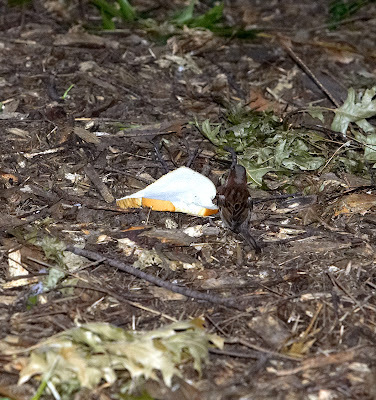 We have seen this woman emptying large bags of bread crumbs and other food scraps on the park grounds in other locations several times in the past . 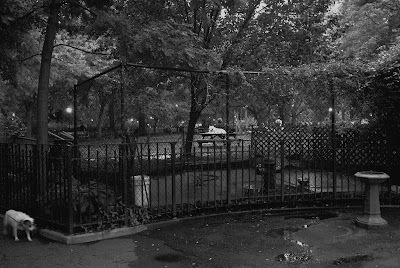 People who spend any time at all in Tompkins Square Park ,especially in the evening and at night , are very aware of all the many rats in the park .They swirl about their feet and scurry to and fro constantly as they sit on a park bench . 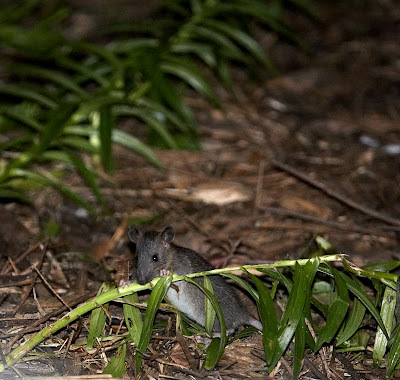 Several people spoke to us about all the rats that they see everyday in the park as we were photographing the rats . 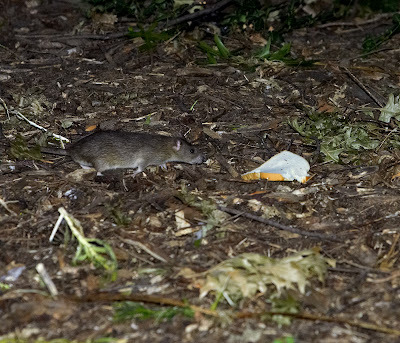 Several told us their special stories about their experiences with the rats of Tompkins Square Park . 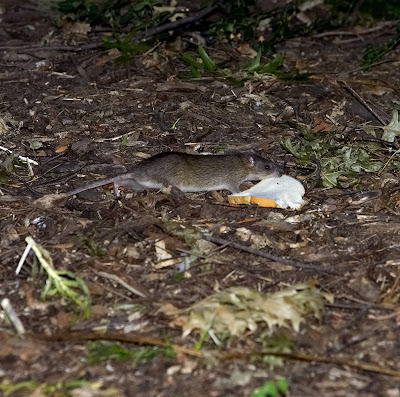 Most also volunteered knowledge of where the best spots were to find the most rats for photographing all of which sites we could not possibly find time to exploit . 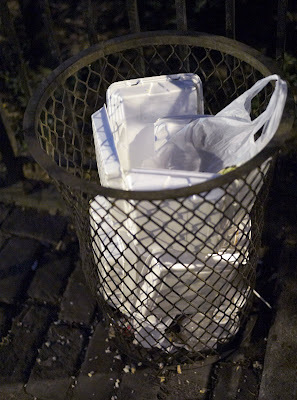 The empty styrofoam containers can be seen in the garbage receptacle below . 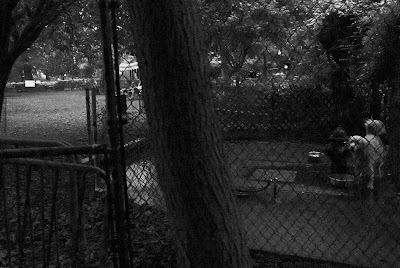 Though perhaps it is true that the food was thrown onto the lawn to feed just the squirrels and pidgeons it is the case in this reality that only one sparrow was seen to peck briefly at one piece of bread : the rats in several number almost immediately homed in on the food scraps and went to work dragging them back home under the evergreen shrub at the 7th st. and avenue A entrance to the park . 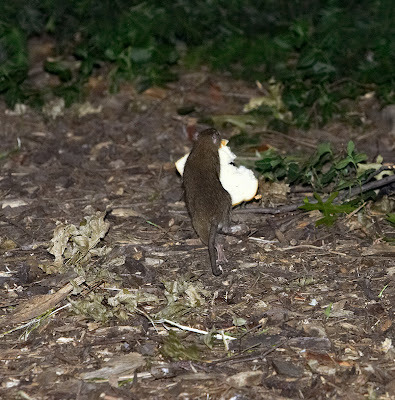 Rats were going for the food within 5 minutes of the food being placed on the lawn . 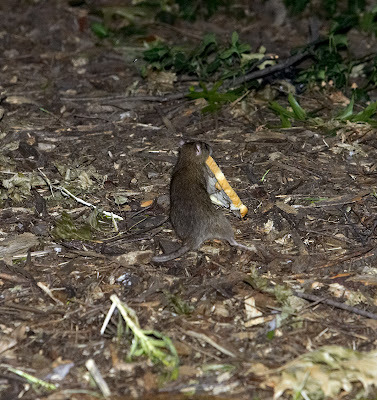 Whether a slice of bread , rice and goop , a chickpea , some lettuce or a whole chicken leg the rats went for it , ultimately eating some of the food on site and removing the rest of it to their lair to be eaten later . 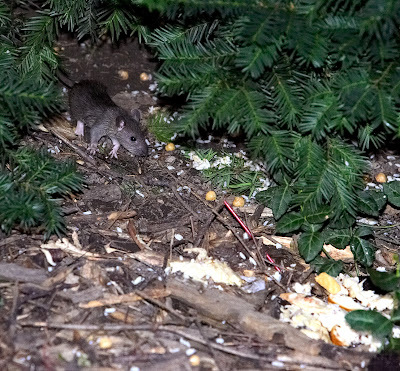 The rat below , it seems , may have eyes larger than its stomach but it did certainly with some effort remove the chicken leg to its lair under the evergreen shrub. 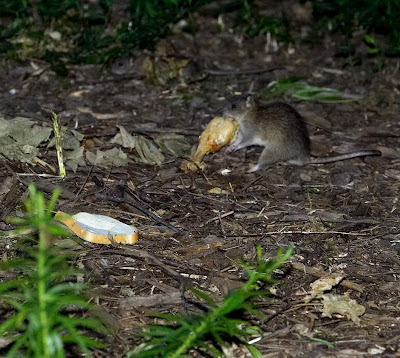 FOUR BELOW : A rat spies a slice of bread , checks it out cautiously and then carries it away to its lair . 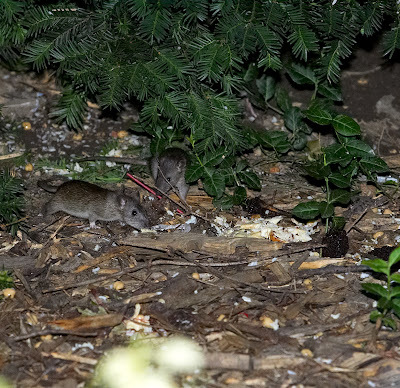 Rats above and below eat some of the rice and goop that was cast on the lawn . 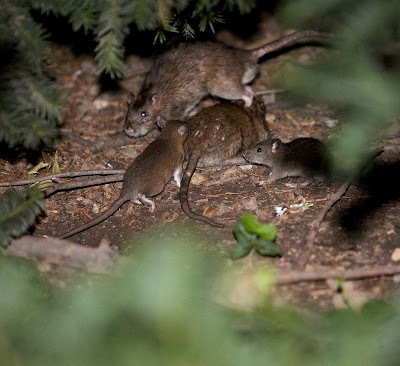 Mom , dad and the kids at home under the evergreen branches of their shrub . Junior has an organic veggie snack munching on a lily stem . 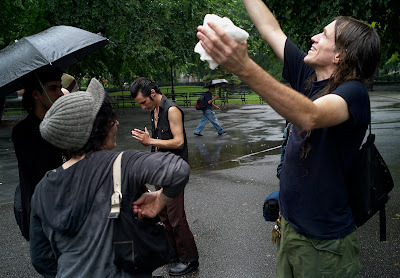 In Tompkins Square Park Sunday there was to be a concert but it began to rain as soon as the stage and sound system were set-up . 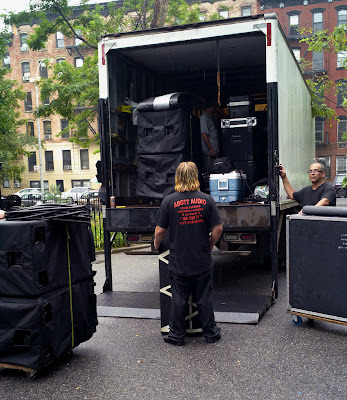 It seemed that it was going to rain all afternoon so a descision was made to cancel the concert and the stage and sound system were disassembled and re-packed in the truck that had delivered them to the park . The one smiling face above , Chris Flash : the one who put up most of the money for the concert and lost it all ...no refunds . And if financial loss were not enough punishment for a good deed done for our community , Chris had just spent the previous 36 hours locked-up downtown because he had been arrested for putting up posters for the concert on the Lower East Side Friday night . ...and workers from Abott Audio are finishing re-loading the stage and the sound system in their truck . There was a photo-op at least and then some hard thinking about what to do since there was one act still available , the permit was still good for more than and hour , a police officer was still on scene for the concert and people were starting to gather around now that the rain had ended . 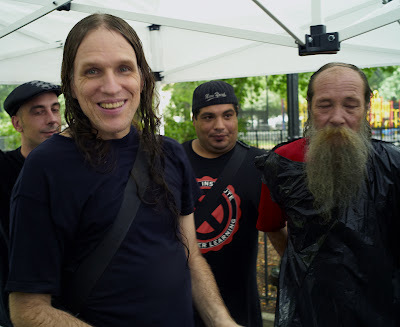 Of course there was no stage ,which wasn't absolutely necessary , but there was also no sound system , which was necessary , since it had been packed away in the truck because of what had been assumed to be an un-ending rain storm . 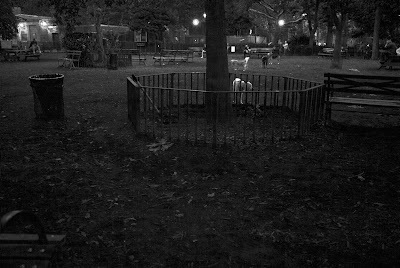 People sat down and waited . 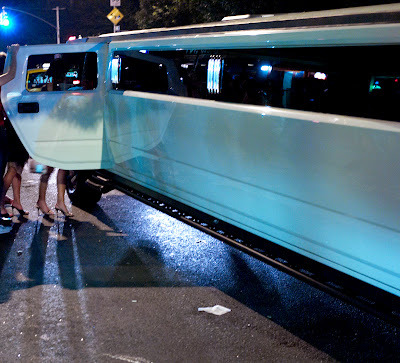 Finally a descision was made to go to a club in Brooklyn to play . Shortly that plan was canceled and later in the afternoon at least one group got to perform . 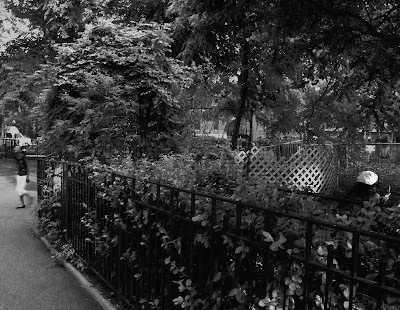 The group " The Voluptuous Horror of Karen Black" played un-anounced live at a bar on 14th st .